Gutenberg Press is a privately owned printing press, based in Malta offering printing solutions to its home market and various European countries. It was founded in 1982 by Mr Frank Spiteri with an investment of around €420 for a Adana Letterpress printing machine. The company grew in strength year by year. In 1996 it moved to a purpose built facility in Tarxien. The new production plant allowed Gutenberg to look beyond Malta to the international field. In 1999 an export department was set up and within a few years Gutenberg had established itself as a printer to the UK publishing market. In 2004, Gutenberg established a sales office in the UK, a key decision to grow its business in this market and at the same time we doubled the production floor space. Our success did not stop here; by 2008 the company was also competing in mainland Europe supplying books to German, Belgian, Dutch and Swiss clients amongst others. 2008 was also an important year at Gutenberg, as a new production facility was inaugurated in Bulebel Industrial Estate. This new production facility allowed us to expand our turnover and target new areas of business. Investment has always been a key to Gutenberg's success, and over the years the company has invested to ensure that it is on the forefront of quality book printers in Europe.2012, saw the further expansion of Gutenberg into the French and Italian book printing markets. In 2013 Gutenberg established a new division, fully dedicated to printing of carton packaging. As with the book side, the company initially and quietly set itself to serve the local market, and is now gaining ground in the European market. Certainly, Gutenberg Press is your ideal print partner for your books, magazines, reports, brochures, carton packaging and more. Since its foundation, Gutenberg Press has remained on the forefront of the printing industry and has always looked two steps ahead for new opportunities and challenges. Gutenberg believes in quality and customer satisfaction and tries to achieve this through constant investment in its people and machinery. Our vision – To remain leaders in the local market and be amongst the top printing companies in Europe. Malta's largest book printer, Gutenberg press humble beginnings. Mr Frank Spiteri founded the company in 1982, with an investment of 180 Maltese pounds (€420). The company started by printing small jobs in a garage in Zabbar. As the business began to grow, Mr Spiteri bought the adjoining garages, to cater for the increased volume of the business. 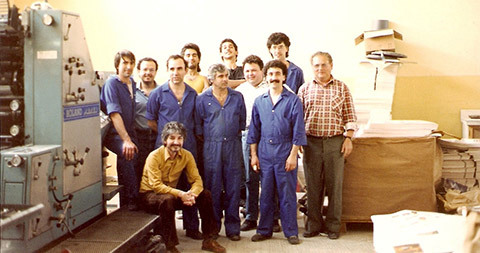 In 1994, the company achieves a stage where it was difficult to operate from the garage in Zabbar, so Mr Frank Spiteri decided to expand the operations significantly. The company bought land in Tarxien, on which the main production plant and the head office were built. In 1999, Mr Guy Chamberlain joined Gutenberg from the UK with the aim to build an export department. This was highly successful and enabled the company to grow at a faster rate, doubling turnover and then tripling it in a matter of few years. In 2003, the factory was further expanded to its present size, in order to cater for the increased volume of business, which was being attracted at Gutenberg Press. In 2008, a different extension to the production plant was added with a new plant at the Bulebel industrial estate. Since its foundation, Gutenberg Press has remained on the forefront of the printing industry and has always looked two steps ahead for new opportunities and challenges. Gutenberg believes in quality and customer satisfaction. This is ensured through constant investment in new technologies and its staff.